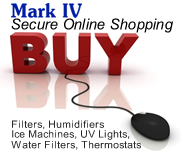 Mark IV Environmental Systems, Inc. is a family owned and operated company with over 19 years experience in the HVAC industry. Mark IV opened its doors in Feb., 1986, as a part time venture. It has steadily grown to a full time operation with 10 employees and has recently moved to a new building on the south side of Indianapolis. We offer service in the entire metro Indianapolis. area and surrounding counties. We maintain five well stock trucks that can be dispatched to your home or business on a 24-hour basis. Our technicians are thoroughly trained on all makes and models of equipment. We are a full service/replacement dealer in the residential and commercial market. We are proud to offer the best equipment in the industry at affordable prices. We strive to help our customers become more knowledgeable about their heating and air conditioning systems so they understand any problems and what needs to be done. We will extend to you the care and respect that you and your home or business deserve from the moment we enter until the time we leave. We are dependable, affordable and honest. In commercial equipment , we are the Manitowoc Ice Machine factory contracted service rep. and the Stoelting distributor for our area. We are ice machine and soft serve specialists with over 35 years experience in the soft serve industry. Our technicians have been factory trained and NATE certified. We also service environmental test chambers in our area for customers such as Ford, Subaru, Eli Lilly and others. Whatever your heating, air conditioning or refrigeration needs our, we can get you the help that you need. Our customers are very important to us. We take pride in our work and strive to provide the highest quality service available. Your family’s comfort and satisfaction is our number one concern.